As I mentioned in a recent Tsukublog posting, preparations for O-Shogatsu traditionally began on December 13th with a big end-of-the-year cleaning called susu-harai, or The Getting Rid of the Grime Ceremony. 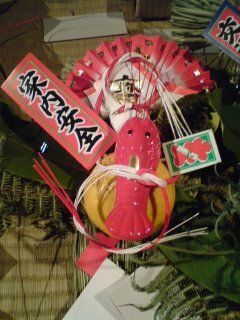 This originally had religious significance, in that it was believed that on New Year’s, the Toshigami-Sama (年神様), or the God of the New Year visited each household which welcomes it/them. It was thus necessary to purify the inside and outside of the house, shop, or office before other preparations could begin. As with most things in Japan, there is a proper way to go about doing this, with a set order in which to proceed. The rule is to begin with the places that New Year’s decorations will be placed: the Buddhist and Shinto altars (for the returning ancestral spirits and the god of the New Year, respectively), the alcove (toko no ma) in the tatami room and above the place where cooking is done. Then the rest of the house is cleaned. It is important to start at the ceiling (over the altars and alcove, etc.) knocking down dust and cobwebs, and working down until everything can be dusted, swept up, and then wiped clean (with new washing rags which should be purchased in this season). One interesting custom is sprinkling the wet dregs of Japanese tea (I mean the used tea leaves) on the mats of the tatami room before sweeping. This supposedly keeps the dust from rising. It also might have an anti-bacterial effect, and certainly gives the room a nice smell for a few days. In contemporary Japan many families wait till after Christmas for this big winter cleaning, but temples, shrines, companies and some families still keep the traditional date. An interesting point to remember is that the male head of the house, should participate in this cleaning and in all the rest of these preparations. This is because the Toshigami-Sama is a female deity according to some, who would not want to visit a home where the wife had to do all the work! After the house has been properly cleaned and purified, it is time to prepare and set up the traditional O-Shogatsu decorations. These include Kado-Matsu (門松), which are placed at both sides of entrances to houses and shops, shimenawa (注連縄) which are sacred ropes for the Shinto altar, Shimekazari (注連飾り), which are decorations for the front door, toko no ma kazari (床の間飾り) for the alcove, and kagami mochi (鏡餅), specially decorated rice cakes used as offerings to the Toshigami-Sama. 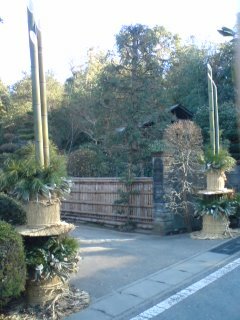 These decorations are collectively called O-Shogatsu Kazari (お正月飾り), and they are made almost exclusively of plants or plant matter, such as rice plants or rice cakes, bamboo, pine, plum, etc. Since the New Year begins after the winter solstice, a time of rebirth before spring (especially according to the old calendar), plants were used as symbols of life and rebirth. The Japanese expression for congratulations, omedeto, originally comes from the expression ome (お芽) de (出） to (度う), which means sprouts appear, or to sprout or to sprout forth. These decorations are a celebration of LIFE, RENEWAL and the BOUNTY of NATURE. Traditionally, they should be put up by December 28th, as the 29th (niju ku nichi) has the sound KU in it which is a homophone for the word suffering, and decorating on the 31st is considered to be too hasty and very unlucky. The 30th is thus the last day on which the Shogatsu Kazari should be set. The Kado Matsu, which usually consists of 3 bamboo stems (representing heaven, earth, and man), pine branches, and plum bound together are placed at each side of the main gate to a house, shop, or building and are believed to act as YORISHIRO, poles or antennae on which the GODS can descend. Pines, which are evergreen, represent long life, and plum is the earliest blooming flowering tree of the year, resistant to cold. Bamboo grows vigorously, straight and tall, making these plants highly auspicious. 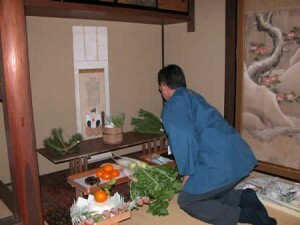 Placing Kado Matsu at the doorway ensures that the Toshigami can find your house without confusion. This custom as it exists today seems to have originated in the Edo Period (1600-1868), though the aristocrats of the Heian court would go to gather pine branches on New Year’s Day. 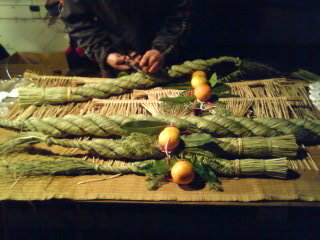 Before WWII it was common to go cut the pine branches and bamboo for Kado Matsu on the 13th of December, but now they are usually bought at stores and set up by the 28th. Have a look at my favorite home-made Kado Matsu in this area (I go see them every year) which you can see near the restaurant KISE. By the way, in some parts of Japan, in commercial districts Kado Matsu are sold at exorbitant prices by the Yakuza (Japanese Gangsters) or other con-artists. My friend from Osaka showed me a little card with Kado Matsu printed on them. He would use them to show these salesmen that he already had Kado Matsu and would not need to purchase any new ones. 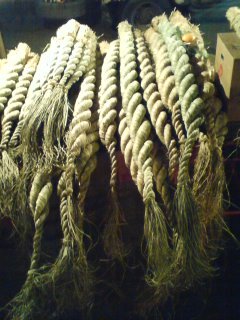 For placing in the Shinto altar, twisted sacred rope was usually made at home from straw, but can now can be purchased at any department store or home center. These shimenawa are twisted counter-clockwise (except for the giant shimenawa at the Izumo Grand Shrine), as this is the proper direction for inviting the gods (it is the direction of Bon dancing and the sumo wrestlers’ ritual). The shimenawa demarcates a sacred space, keeps out evil and also acts as a sign post for the gods. The origin of these sacred ropes lies in the story of the Sun Goddess Amaterasu, who after having been lured out of the cave she had been hiding in (ama no iwa to) and bringing back with her the sunshine which the world had been temporarily deprived of, was prevented from ever going back into seclusion by a rope of straw which was placed over the mouth of the cave. You can see a typical shimenawa here. For hanging on the front door, there is the shimekazari, which varies from region to region but always contains many auspicious ingredients. In this area, there is usually a small folding fan on top representing the spreading of your seed (plenty of descendants), an orange (daidai) whose Japanese name also means GENERATION AFTER GENERATION, and a small lobster (in Tsukuba these are usually plastic!) who with their bent backs represent attaining old age. There is also some red and white folded SHIDE paper which is effective for preventive impurities from entering the house. Since ancient times, pounded rice cakes (o-mochi) have been offered to the gods as sacred food in Japan, and they have a central role in New Year’s celebrations. The two (or more) round rice cakes stacked one on the other and set in the Shinto altar and in the toko no ma alcove during O-Shogatsu are called kagami-mochi (鏡餅), which means mirror mochi. This is a reference to the ancient bronze mirrors which were believed to be sacred treasures and receptacles of the gods. Two rice cakes, one smaller than the other, represent the sun and the moon, yin and yang, and marital bliss. In the old days, these cakes would be made by each family, but now they can conveniently be bought at supermarkets and department stores. 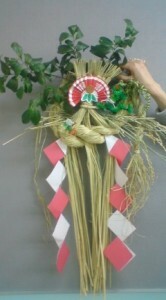 They are usually placed on a wooden tray and often decorated in the same way as the other New Year’s decorations are. It is also customary to decorate the tokonoma (alcove in the tatami room) with appropriately auspicious decorations. A hanging scroll with pine, plum, lucky Gods or cranes, kagami mochi, and rice or other crops can help create the proper O-Shogatsu atmosphere. Well, I think that that is enough for now, as I have to finish up my own New Year’s cleaning. On Tuesday, the 28th, I will be heading to the DORO ICHI in Yatabe, to pick up this year’s oshogatsu decorations. Maybe I’ll see you there. I read your post on new year etc.. Very informative and detailed! Better than wiki. I didn’t know that there are certain dates for putting up the oshougatsu kazari? Do people still follow the dates to put them up? I just saw many people still buying it when I went shopping just now. Also, there are people who didn’t put up at all – only one neighbor in my apartment does that! But the corridor of her apartment and windows haven’t been cleaned at all! My mother-in-law just ties stalks of store-bought pine leaves to her gate. Not elaborate, though. Avi, what is the significance of the fern leaves included in some of the new year decorations? When you say that these decorations should be put up by Dec 28, does it mean that they can be put up before that date? Hi Alice. Happy New Year. The fern often seen in SHIMEKAZARI is called URAJIRO (裏白) in Japanese. As it is an evergreen, it represents LONG LIFE. You might also have seen another type of leaf (usually two of them)used as well. These are called YUZURI HA, and represent passing happiness down to the next generation. This is because YUZURU ( from the name yuzuri ha) can mean- to pass onto, or yield to. 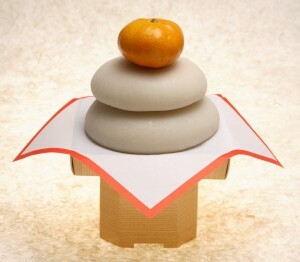 Other typical elements of the SHIMEKAZARI are an orange (DAIDAI), which also represents the success of ones descendants as DAIDAI can also mean- genration after generation. A small fan also repesents the increase of one issue, as the fan opens, and spreads out- as do ones descendants. Kelp (konbu) represents happiness, as the word konbu is reminiscent of the word YOROKOBU (to be glad). And finally, the zizag shaped stips of paper SHIDE　are for keeping away impurities.